Do you want to try something different when it comes to working out? Do you feel like dancing your calories and worries away? Yes?! Well, we have some good news for you! With a professional Zumba Dubai trainer, your workouts won’t even feel like an exercise. Dubai Personal Trainers are professional coaches that will help you reach your goals by making a dancing workout plan. Choose a trainer and transform your body! Zumba Dubai – What to expect? The very first thing we have to say about Zumba is that is fun! Forget anything you know about classic workouts, gyms, and tiring exercises. If you like upbeat and fast music, you won’t be able to stop moving. There are many benefits of Zumba dance workouts. Let’s take a quick look at the most important ones. 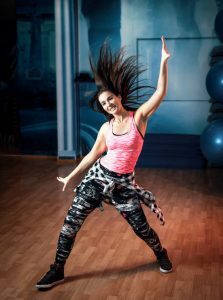 Zumba dance classes in Dubai that are held by our best trainers are major dance exercise parties. With planned choreographies, you will be able to easily follow the beat of the music and burn calories along the way. During a training session that lasts an hour, you can easily burn 600-1000 calories! The Zumba dance moves are choreographed to help you burn calories and lose weight. With its high-intensity exercises, Zumba is one of the best cardio exercises for anyone that loves working out to the beat of the music. Zumba is a full-body workout! Being a mixture of a dance and a fitness Zumba activates your entire body. 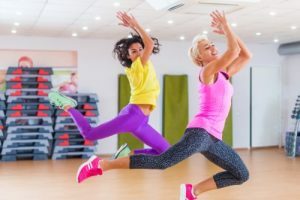 Even though you might feel sore after the first training session, it will be fun and just like most of us, you will continue to dance the calories away! Classes involve dancing, jumping and bouncing. 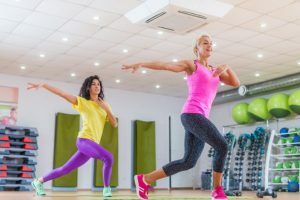 As its fast-paced moves are considered to be a great cardio workout, many personal fitness trainers in Dubai include Zumba in their training plans. With the help of a professional Zumba Dubai trainer, you will improve your cardiovascular health as well. Zumba will also positively affect your metabolism and boost the calorie burning process. Just like with any other physical activity, aerobic exercise routine of Zumba will positively affect your cardiovascular and respiratory system. With such a fast pace, Zumba will help you build up endurance very quickly. Performing dance moves requires many different parts of your body moving at the same time. Therefore, moving to the beat of fast-paced music you will also improve your coordination. You will have fun and be happier with Zumba Dubai workouts! Dancing to the beats of salsa, and other fun music rhythms won’t feel like exercising at all! Zumba classes may even help you make new friends and dance partners! Just like with any other great workout routine, when you exercise with Zumba Dubai your brain produces dopamine. The chemical that is in charge of creating feelings of happiness and pleasure. Therefore, besides the fun exercises, Zumba will boost your mood and help you have a healthier lifestyle. Zumba is all about being happy and self-acceptance and love. Therefore, this routine focuses on their practitioners having fun rather than on sculpturing a perfect body. This is exactly why Zumba is an aerobic exercise for anyone. Age, gender and fitness shape have nothing to do whether you can join a Zumba class. This dancing community is extremely open and welcoming. We believe this is the main reason Zumba has quickly managed to become so popular all over the World. As Zumba is widely popular, it has changed and evolved quickly. Therefore, there are more than just a few different styles of Zumba Dubai routines you can practice. This routine is great for older people. Also, it is a great workout for beginners who want to get to know Zumba from the basics. It is a modified, slow-paced routine, that focuses on balance and coordination. Zumba Gold cam improves your muscular and cardiovascular condition. Also, it will definitely improve your balance, flexibility, and coordination. Zumba Step is a great lower body workout routine. Its aerobic dance moves will tone your legs and glutes. This is also a set of great cardio exercises that will help you burn calories and strengthen your core, legs, and glutes. By incorporating light weights or toning sticks, dancing with Zumba Toning, you can sculpt your whole body. Lightweights and Zumba sticks will improve your rhythm and coordination while engaging many different muscle groups at the same time. Therefore, Zumba Toning will be a great whole body workout for anyone who is looking for a fun way to sculpt their core and lower body. All right, we need to admit that the title was just for fun. It is not really slow dancing. Zumba Gold-Toning is a slow-paced exercise routine. It is a great workout for older adults that want to tone their body. Lightweights and unique choreographies not only help you sculpt your muscles but can also prevent many health conditions like loss of skeletal muscle mass, reduction of muscle strength and atrophy. Aqua Zumba – Have you tried dancing in a swimming pool? Aqua Zumba is a great aerobic exercise routine done in a swimming pool. This is a great workout for anyone who had previous joint injuries. Even though water will be a resistance force, there will be much less pressure on your joints. Even though fun, this routine can be much more challenging than others. With water resistance, you will have to pay attention to each move, which will help you tone your body. Zumba Sentao – Let a chair be your dance partner! No, we are not kidding. You get to dance with a chair when practicing Zumba Sentao. With innovative dance choreographies that focus on the core, this great routine sculpts your body, burn calories and improve your cardiovascular condition. This fun routine was invented so kids from 7 to 11 years old can be active, healthy and learn to love exercising while having fun. Zumba Kids is more than just a workout routine. It is a set of exercises, games and dance moves. With such fun workout, kids develop a healthier lifestyle and improve their self-esteem, confidence and teamwork skills. There are many great personal trainers for kids that have improved the routines and customized them according to the area and culture children come from. Zumba Kids Jr. – Created for the youngest Zumba fans! Just like Zimba Kinds, Zumba Kids Jr. is a great way to incorporate healthy habits into your children lifestyle. As it was designed for kids between 4 and 6 years old, this routine resembles more a dance party than a workout. All exercises are children-friendly and include games and various other activities. With Zumbini, parents from all over the World get to, sing play and learn with their kids aged 0-4. Even though Zumbini is not a typical workout, its sessions include dancing, singing, and learning through playing with educational toys. Zumbini helps your kids improve their motoric, cognitive and social skills. It also incorporates a healthy habit from a very early age. Do you want to develop circuit skills while dancing to Latin music? The combination of dance choreographies and circuit training will boost your metabolism and represent a great full body workout. With Strong by Zumba routine, you can work out perfectly synced to the music. Each dance move is choreographed to be driven by the music and is a great way to burn belly fat, lose weight and tone your whole body. Zumba was created in the 1990s, by a Columbian dancer and choreographer Alberto “Beto” Perez. Zumba is a mixture of dance and aerobic moves. More than 15 million people attend Zumba classes all over the World. Zumba is being exercised in 180 different countries. ZINcon is an annual Zumba conference for instructors held in the USA. Since 2010 there are even Zumba video games. An hour of dancing at Zumba Dubai classes can help you burn from 600 to 1000 calories.